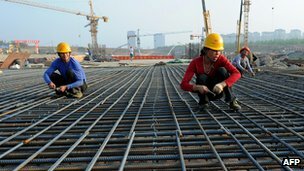 China's services sector, which includes construction, saw its pace of growth slow in May adding to fears about a slowdown in China's economy. The non-manufacturing purchasing manager's index (PMI) dropped to 55.2 in May from 56.1 in April. The news comes just days after Beijing reported a sharp drop in activity in its manufacturing sector during the month. The services sector accounts for almost 43% of China's overall economy. "Simultaneous weakening of manufacturing and non-manufacturing sentiment confirms further loss of momentum in the Chinese economy in the second quarter," said Dariusz Kowalczyk of Credit Agricole CIB. The PMI is key indicator of activity in the sector and a reading above 50 shows expansion. However, the reading has now fallen for two successive months and the number for May was the weakest for more than a year. The latest numbers are expected to put further pressure on Beijing to ease its monetary policies in a bid to boost growth. The central bank has already made some moves in recent months, including reducing the amount of money that banks need to hold in reserves, in a bid to spur growth in the country. The hope is that such a move would help boost lending and boost domestic consumption. However, analysts said given the current economic situation, the bank needed to go further and reduce the cost of borrowing. "If rates are cut, sentiment could recover on hopes that policy makers are finally coming to support the economy," said Mr Kowalczyk of Credit Agricole CIB. He added that a cut in interest rates may happen as early as this month.